Are you ready to make a festive holiday mess, and for your home to smell absolutely amazing? Good! Because if so, you have definitely come to the right corner of the internet. 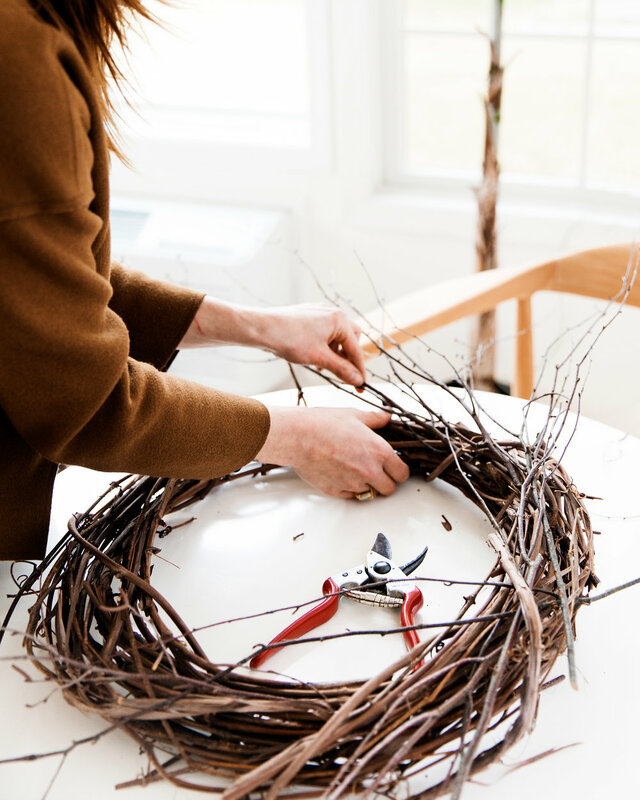 My lovely friend Aimee, founder and creative boss lady behind Ferox Studio, has graciously taken time to walk me through a little DIY holiday wreath step-by-step guide. Aimee’s designs are always gorgeously layered, wild with texture, and focused on letting the natural elements really stand on their own. Aimee and I are so excited to be collaborating on a wreath making event and holiday party here in Philadelphia the first weekend of December. The event sold out very quickly, and while the materials will be different, and the in-person experience the best way to learn from her, I really wanted to share an accessible version of what we’ll be creating at the workshop. This guide will help you to create a hanging wreath for outdoors during the fall and winter months. If you’d like to turn this into an indoor wreath (which you totally can!) we suggest that you completely avoid pine, as the needles will drop. The beautiful thing about making a wreath like this, is a lot of it can be foraged. If you have an abundance of sticks lying around, save them up and repurpose them here to help shape the base of your wreath. Our yard has innumerable amounts of branches, and two different holly trees. Last year I carefully clipped away to bring the outside in during the holiday season, peppering the holly berries around in different spots to keep it feeling cozy and festive. If you also have holly in your yard and decide to repurpose it for this project, be mindful of how sharp it is to work with. Adding a more earthy element this time of year can make your home feel even cozier, which is why I love how all of the greenery that Aimee has showcased in this wreath. She focused on a more asymmetrical design, which I totally love. I kept this guide pretty lose so that you can feel inspired to go with your gut, and let your materials lead the way. Thank you so much for sharing your expertise with us, Aimee! Ready your materials! 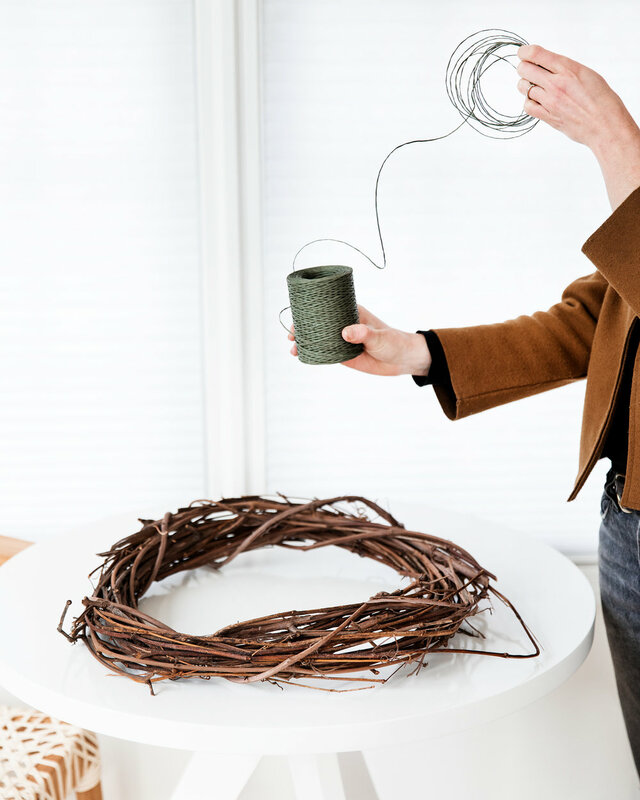 You’ll begin with your grapevine wreath, floral cutters, bind wire, and dried branches nearby. Decide which shape you’d like the branches to make. 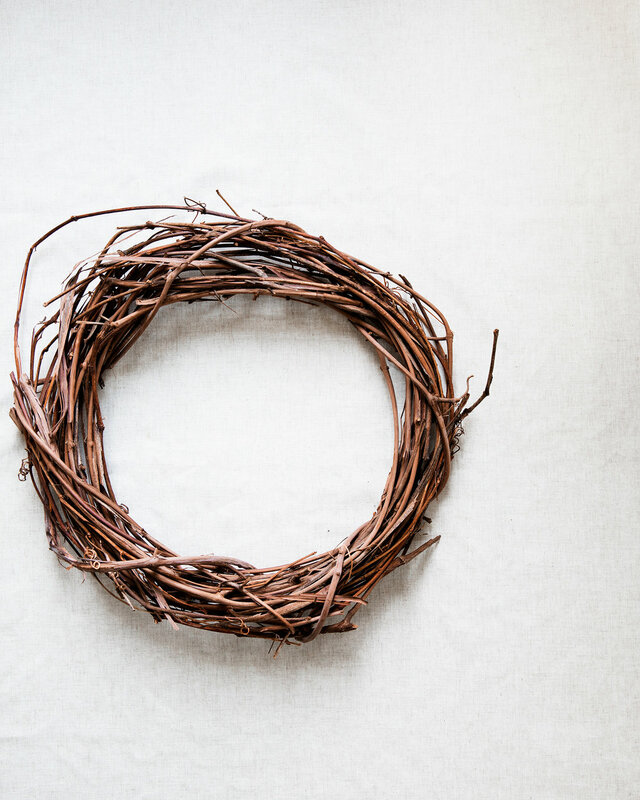 For an asymmetrical look, allow the branches to sit on either the right or left side of the grapevine wreath. Start by making your desired shape with the branches, use the floral cutters to trim the branches as needed. You can let it be as formal, or wild looking as you choose! Intertwine the branches into the grapevine as you proceed. Use the bind wire to tie the branches taught around the grapevine in any areas where it feels needed. The wire will be covered up with the other floral elements, so no need to worry about it showing at this point. Begin adding your evergreen pieces. 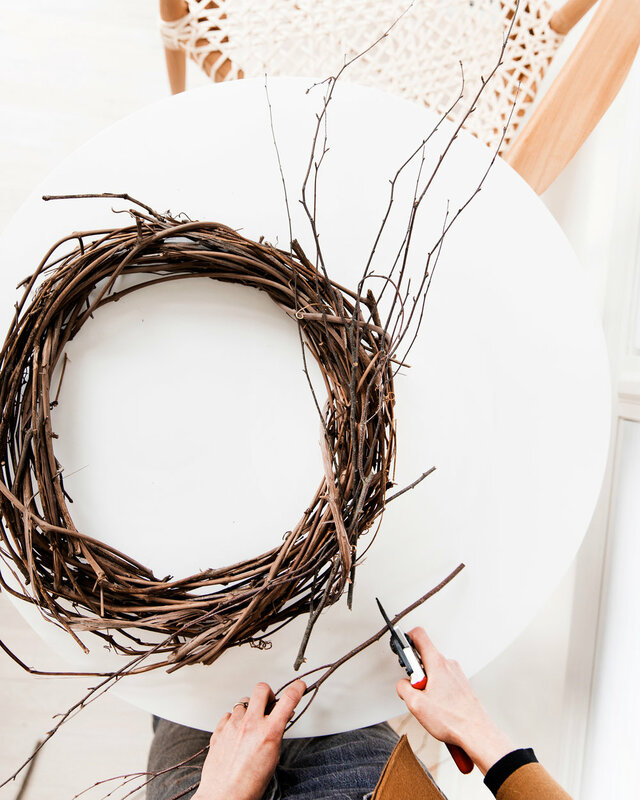 Intertwine them between the branches and the grapevine wreath, until they are well situated and don’t feel loose. You’ll want to take some time here to really tuck them into place. Mixing sizes will create a more layered look, so try various arrangements of short pieces alongside long ones. 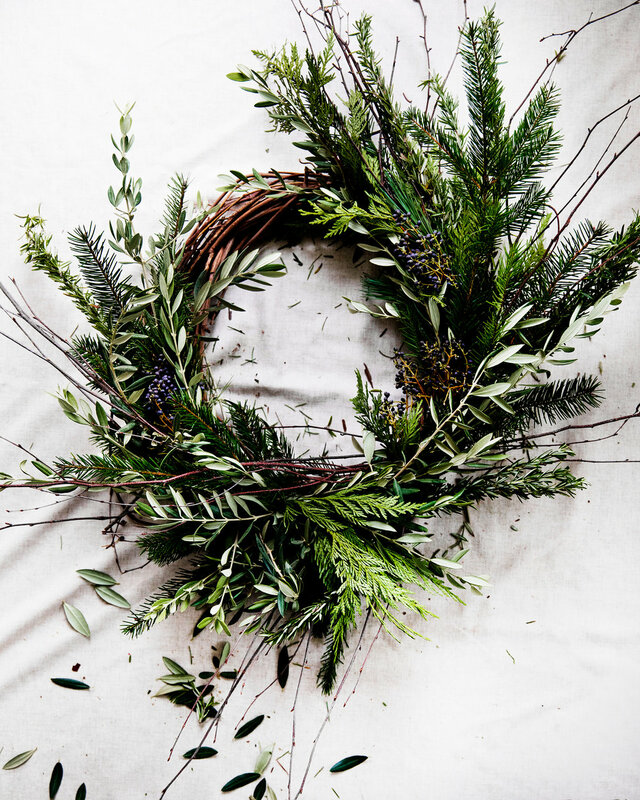 Begin layering in the rosemary, and olive branch pieces, tucking them securely into place within the wreath as you go. To create a varied look within the shades of green, flip certain pieces of evergreen over to reveal a lighter or darker color. 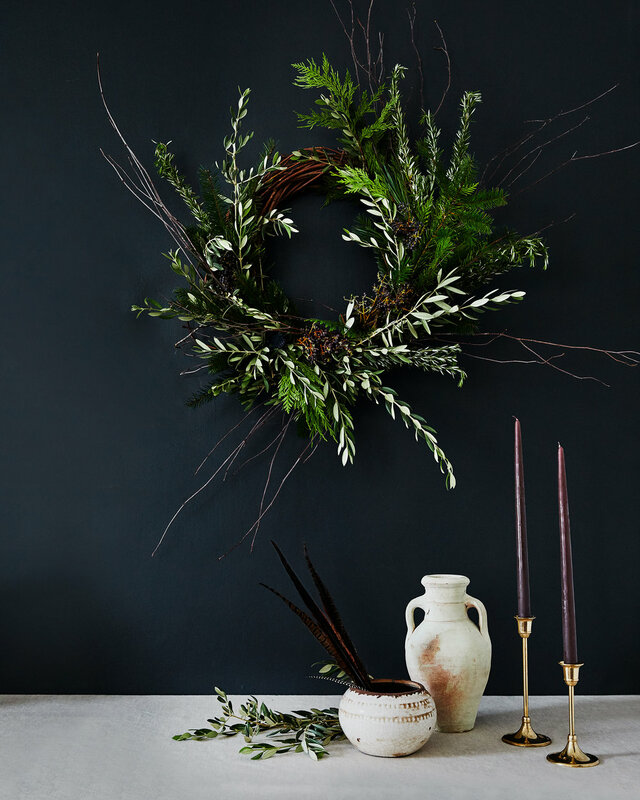 Now is a good time to add berry branches, or other small dried floral that might add pops of color. Make any necessary tweaks to ensure that all of the pieces are securely woven into the wreath base. Once it feels ready, hang on a door or wall hook!